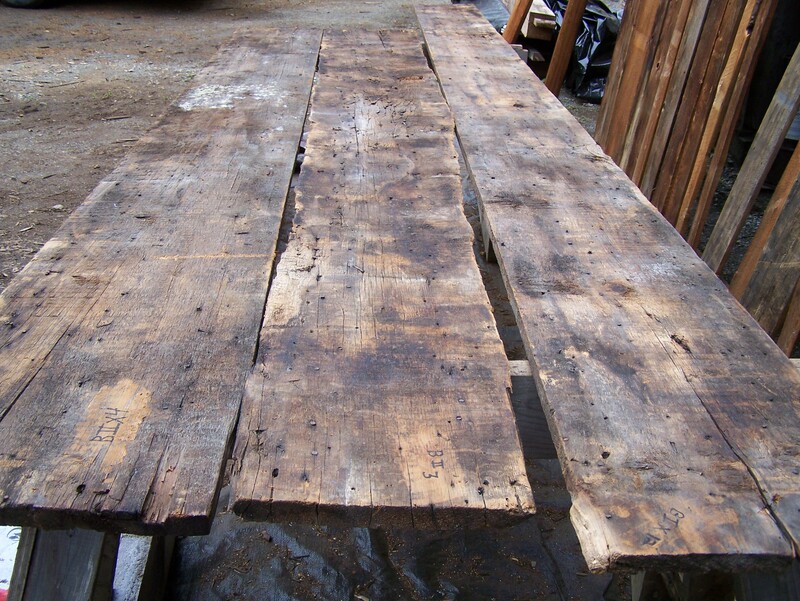 Behind the Scenes: How do you restore old wood? Today I want to share a bit about the “behind the scenes” work that goes into restoring historic properties. 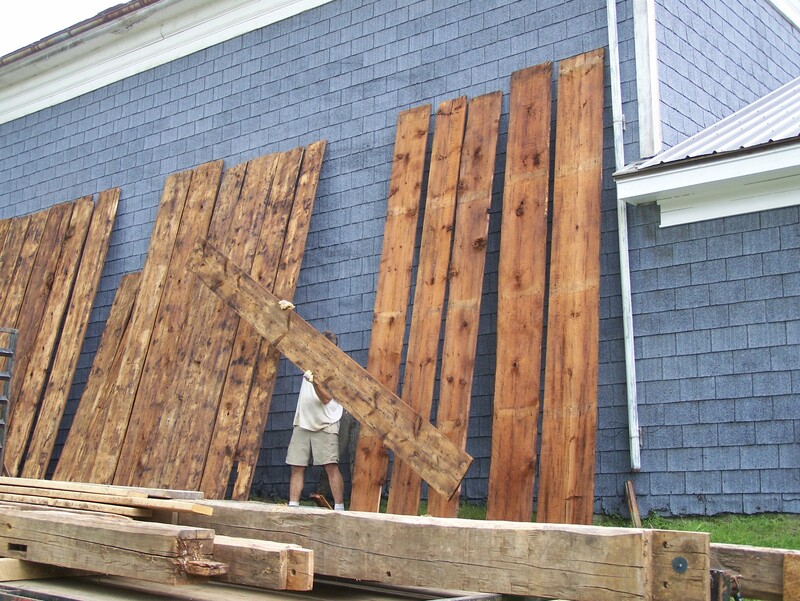 I am going to share the process we use to restore 240-year-old roof boards on a barn from 1774. And while I recognize that the technical sides of my work may be less fascinating to some of my readers, I do know that there are a few of you out there who are interested in learning about the nitty-gritty details of timber framing. 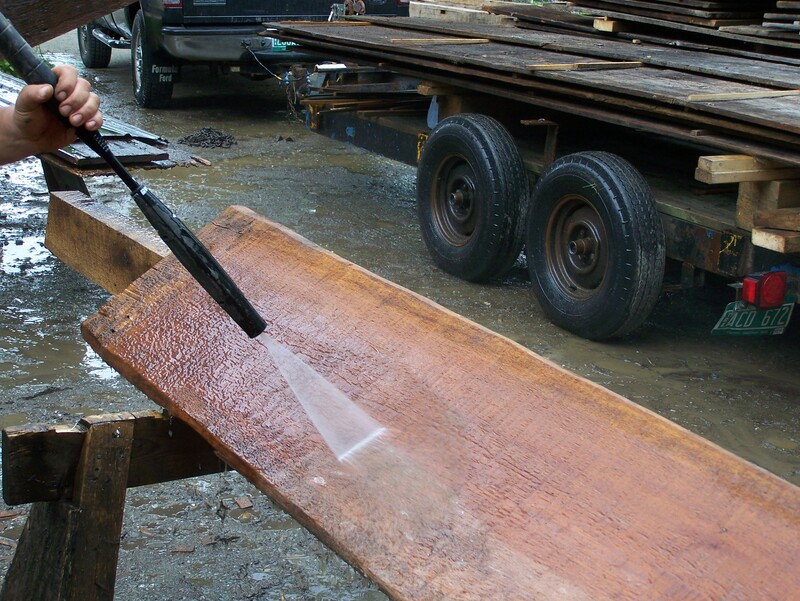 So how does one restore 240-year-old wood? 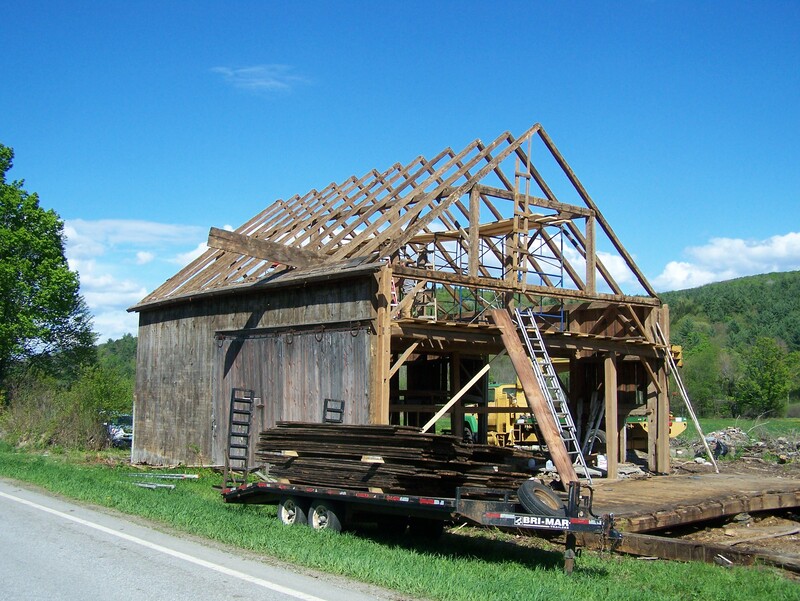 Restoring old timber frames and turning them into new custom barn homes is a multi-layered task with many steps along the way. 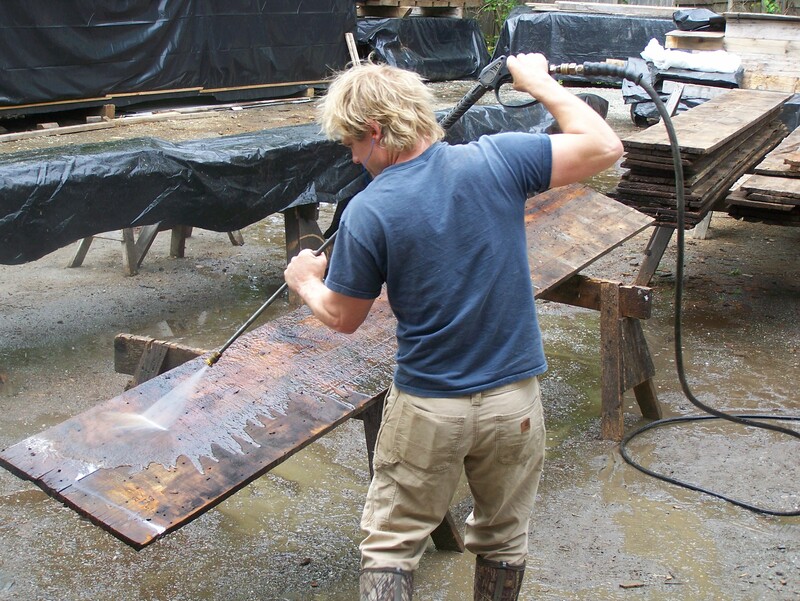 A significant part of the work is spent carefully refreshing each piece of timber, from the siding to the roof boards. As I walk you through the process step by step, I’ll show pictures from the 1774 barn roof boards we recently restored. 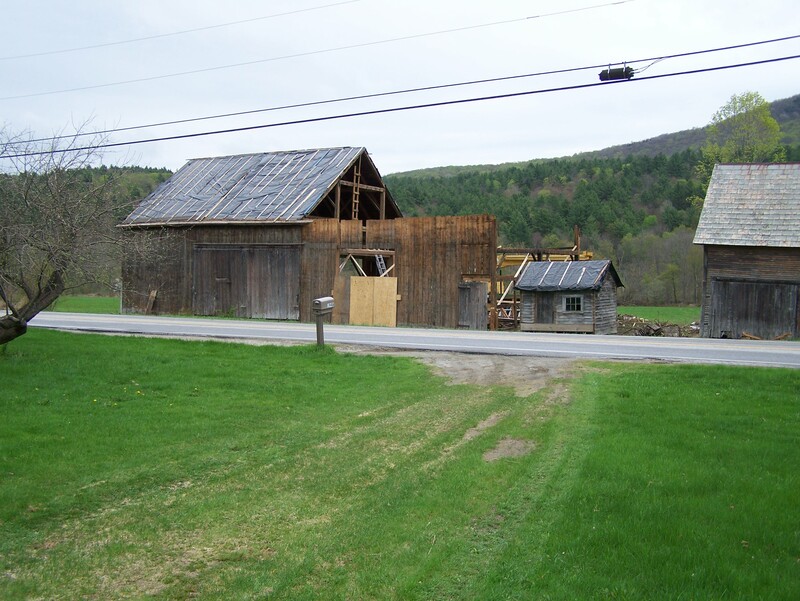 Most barns we restore have slate roofs, but slate was only discovered in Vermont in 1834. This barn was originally roofed with local white cedar shingles as its first roof. Sixty years later they added a slate roof. The first step in this project was to remove the slate shingles from the frame. We then created a temporary roof to protect the antique beechwood beams during the renovation process. In the photo below, we had already removed the slate over the winter months and covered the roof with a piece of strong black plastic to protect against the spring rains. This also helps keep the frame in good condition until we could officially start the dismantling process. We then carefully removed each roof board. During this removal process it’s important to label the boards, using a system that is clear to everyone working on the project. After restoring the beams, the labeling system will help us as we reassemble the hand hewn frame and return each board to its original location in the post and beam structure. 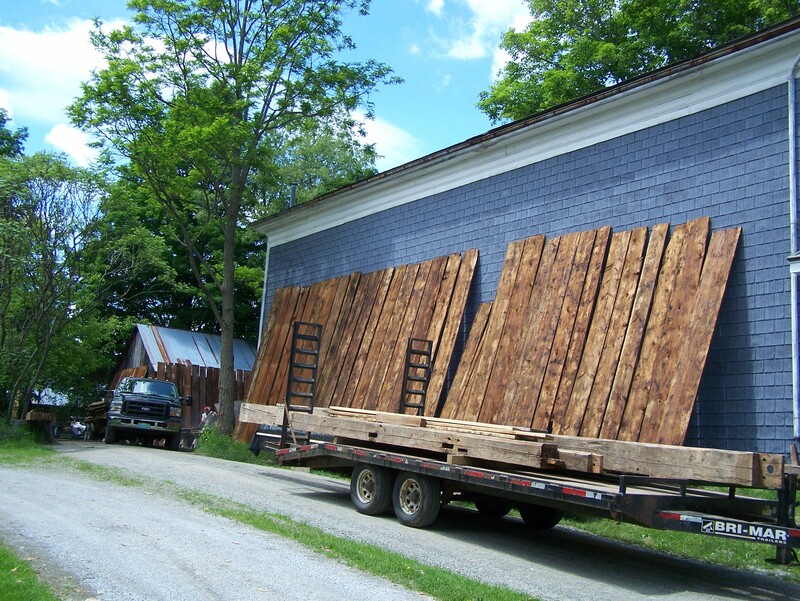 Once we dismantled all of the boards and timbers, we loaded them onto a trailer transporting them to back to our shop in Middletown Springs, Vermont where we spent several weeks restoring the timber frame. Back at my shop, we unloaded the trailer and carefully scanned each roof board for old nails. We removed all of the wooden shingle nails that we found in the wide roof boards, knocking out about 100 nails per board which is typical in pre-1800 timber frames. Scanning the roof boards for nails. After we thoroughly washed the boards, we left them out to dry for two sunny days. Sometimes it can be a challenge to find two sunny days in New England! We flipped and turned each board to ensure they were completely dry. In this final picture, you can see the results. Two hundred and forty-year old wood – restored for our future. A roof board first cut 240 years ago, restored. It’s amazing to think about. I stare at the 250 rings of growth and realize that these boards were ‘born’ nearly 500 years ago. Early timber framers in Vermont (1750 to 1800) had the luxury of being able to use the finest of materials – first cut trees, grown strong over centuries. Trees in New England had never been cut for lumber before. In this restoration project, as with other barns we have restored from this time period, the wide pine roof boards were made from first cut timber. You can recognize this beautiful wood from the tight bands of growth rings, showing slow, strong growth. 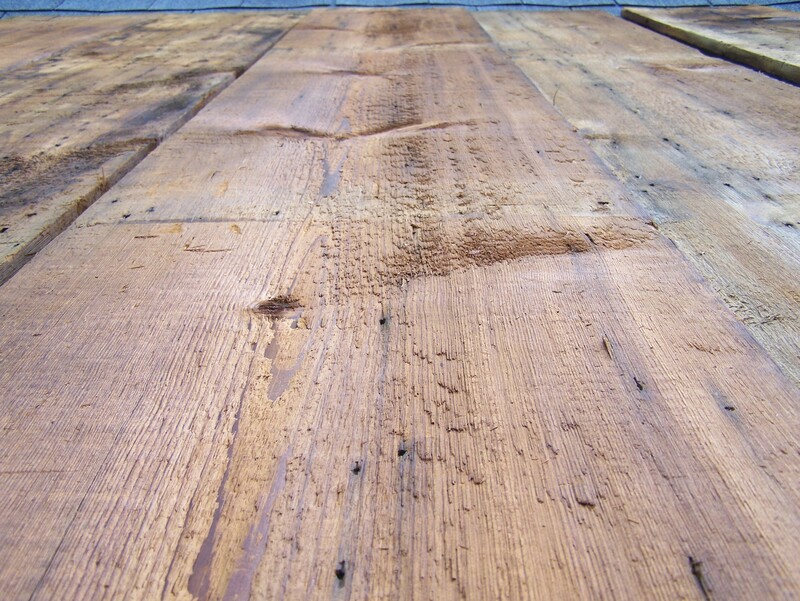 In addition to strength, the aging process over 240 years give the boards a color that can’t be duplicated. Now the boards are restored and ready to shed water again. I hope, as with each of our projects, that the future owners will maintain these structures. When this frame is re-erected, with all timber and boards restored, it will allow us to have a glimpse into the past. After the raising, we can imagine how proud these builders must have felt to erect such a fine barn. (And of course they did it without the help of power tools and cranes.) We are honored to restore their work which can now stand for centuries to come. 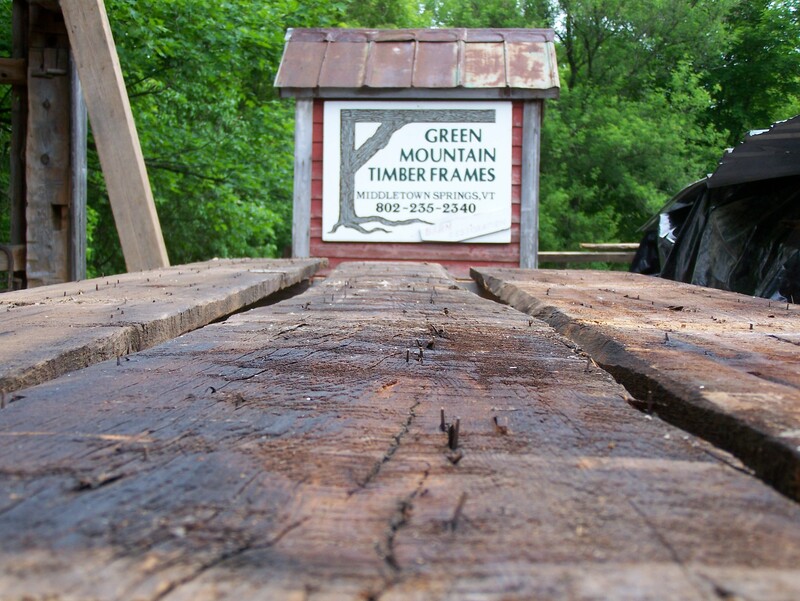 Want to come see some of the timber frames at our shop in Middletown Springs? Please let us know! This entry was posted in Green Mountain Timber Frames, Middletown Springs, Vermont, Post and Beam, Timber Frame Projects, Timber Frame Videos and tagged barn restoration, historic New England, historic post and beam homes, restored wood, restoring timber frames, restoring wood, roof boards, timber frames, vermont timber frames by Green Mountain Timber Frames. Bookmark the permalink.